Linda spent the majority of her career in education, beginning on the East Coast but then working primarily in Northern and Southern California. She was a teacher, and then served as both a school site and district office administrator. 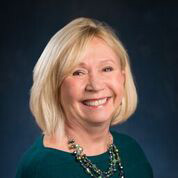 After retiring and moving to Bend, she was a member of the city’s Arts, Beautification, and Culture Commission, serving as co-chair for the latter part of her term. Working at the High Desert Museum with birds of prey was another volunteer experience. Linda is a hospice volunteer who is often accompanied by her Hos-Pet therapy dog, Zultan.